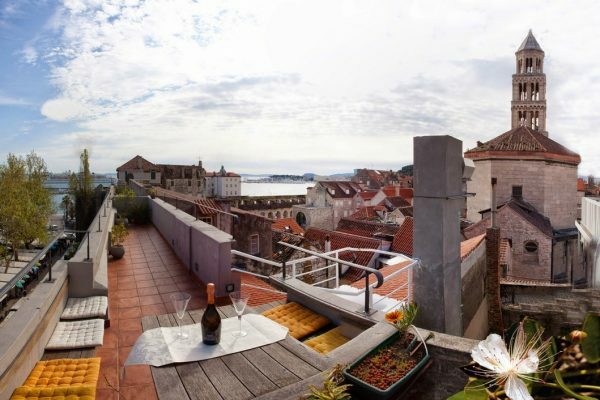 ST0915 – A beautiful, modern apartment for sale Split, on the top floor of a small residential building, with a spacious terrace and fabulous sea views. This newly renovated 127m2, three bedroom apartment covers the entire second floor of the building. It consists of three bedrooms, two bathrooms, a modern open plan kitchen, dining and living room and a large terrace with a beautiful sea view. The apartment comes with a garage included in the price. The apartment for sale Split is located in a prominent residential area of Split, only app 100m from the beach. The neighborhood consists of mainly large family homes, luxury villas and lots of greenery. The town center is only 15minutes away on foot and the cities largest park Park Suma Marjan is just around the corner. There are several lovely pebble beaches in the neighborhood, a communal swimming pool, tennis courts and numerous other possibilities for sports and recreation. The city Split is a very popular holiday destination with many historical and cultural sights, lots of interesting shops and galleries, many great restaurants and fun bars and clubs. The city is known for its ancient city center with the Roman Emperor Dioclacian’s palace and its stunning promenade the Riva. During the summer months there are numerous cultural events and music festivals which makes the city a lively and popular tourist destination. Split is located in the center of Dalmatia and is very well connected to the rest of the country, also the main ferry port is in Split from where there are frequent ferry and catamaran lines to and from all the Dalmatian islands.